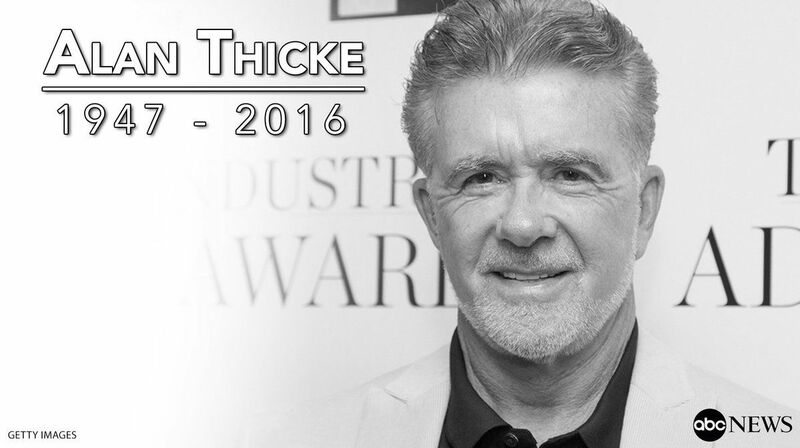 I am incredibly saddened to learn of the passing of Alan Thicke. I watched this man on Growing Pains for 7 years of my childhood and realized quickly what a good father looked like. From the sounds of it, it wasn't an act because it seems he knew something about being a good father. My thoughts and prayers are with his friends and family and all the fans who loved him. Your tag about says it. Famous deaths. There have been SO many greats to go this year. It's depressing. So much artistry and good people. They'll be remembered by all, family and everyone they touched. It's so true. This has been a bad year all around and I'm looking forward to it being over. It is true. We've been watching This Is Us and he was just on. So sad. So sad. I also watching him in Growing Pains. I know. I'm so over this year. I just watched him on 'Fuller House' and the following day I learned he had passed. So sad.